• Raise awareness of the need for international cooperation to tackle today’s global problems. The following models explore various aspects of intercultural learning and form the theoretical foundation for this guidebook. 2. Developmental model of intercultural sensitivity (DMIS) also known as the Bennett Scale (Bennett 1986, 19943. As communities and societies become increasingly interconnected, so does the importance of intercultural abilities for dialogue and cooperation. The abilities of understanding, respect and dialogue outlined in the UNESCO definition as the foundation of intercultural learning directly correlate to the learning categories of knowledge, skills and attitudes also known as KSAs. 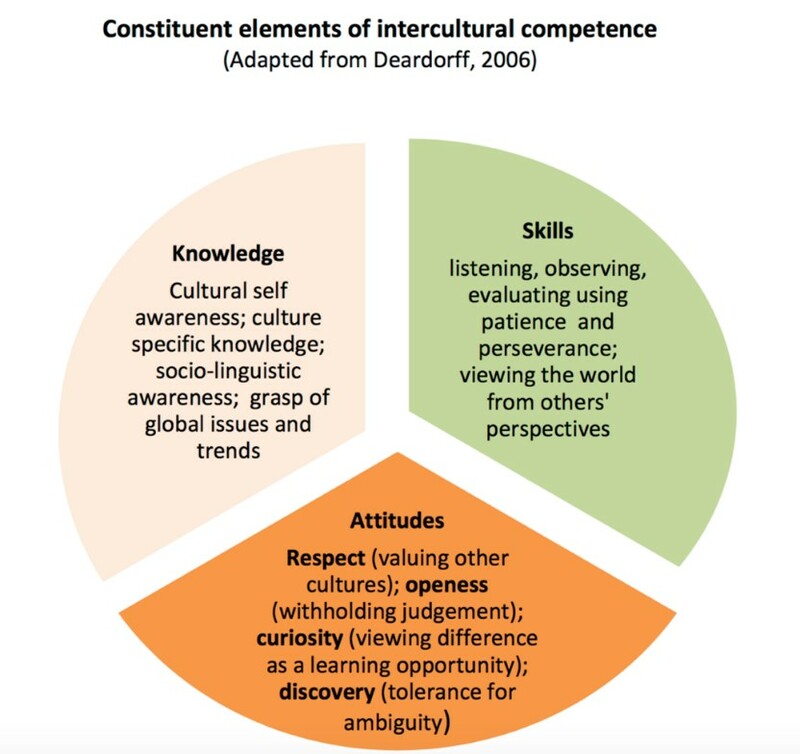 A leading theorist, Darla K. Deardorff, worked with international scholars in intercultural education to develop the following model on intercultural competence. In her model, Deardorff explores the necessary KSAs to be able to communicate, cooperate and learn effectively together with people from different cultural backgrounds. See Figure 1. To develop intercultural competence, the first step is to know oneself and understand one’s cultural identity; specifically cultural self-awareness is the ability to understand how one’s culture influences behaviour, identity and point of view. Being self-aware enables people to understand the world from other cultural perspectives or world views once they learn culture specific knowledge of other communities. Culture specific knowledge is the deep understanding of ideas, customs, and social behaviours of other cultural groups. In particular, socio-linguistic awareness is important because knowing when certain vernacular or body language is appropriate enables people to communicate more effectively. For example, the Dutch are known for being direct in their communication style especially when compared to the British, and therefore messages are interpreted differently. See Table 2 for a study of phrases and translation between the two nationalities. Finally a grasp of global issues and trends can explain behaviours and customs as well. Emotional resiliency is the ability to adapt in times of stress or crises. While navigating difference can be stressful, having an open minded attitude can help people adapt to new situations and step outside of comfort zones. To overcome the ‘fear of difference’, developing an attitude of curiosity, openness, respect, and discovery can become one’s attitude of emotional resilience. CORD is an acronym to help remember the individual “strands”. Deardorff’s framework provides deeper definitions of the different attitude “strands”. Discovery: tolerate ambiguity and view it with a sense of discovery. Deardorff suggests that each of these skills should be utilised with “patience and perseverance to identify and minimize ethnocentrism”, the habit of evaluating other customs, beliefs, and norms from one’s own culture. Instead, “seek out cultural clues and meaning” in order to question one’s thinking and assumptions and compare to another’s thinking. For sample ground rules to establish a respectful space for dialogue, see Table 3. If you are offended or uncomfortable, say so, and say why. It’s OK to disagree, but don’t personalise it; stick to the issue. No name-calling or stereotyping. One person speaks at a time. Personal stories stay in the group, unless we all agree that can share them. We share responsibility for making the conversation productive. Source: Everyday Democracy. (2008). A Guide for Training Public Dialogue Facilitators. (p. 43). As people develop intercultural competence, their mindset moves from a monocultural mindset to an intercultural mindset. Internal outcomes of this process include the knowledge, skills and attitudes described above and lead to flexibility, adaptability, empathy and an enthorelative perspective. External outcomes that result are effective and appropriate communication and behaviour as viewed by other perspectives or cultural groups. See Table 4 for a list of characteristics of an intercultural competence as described by the Intercultural Competence Assessment (INCA), funded by Leonardo da Vinci II. According to the Developmental model of Intercultural Sensitivity, also known as the Bennett Scale after Dr. Milton Bennett, this transformation occurs over 6 stages. These 6 stages describe how a person can react to cultural differences. People who are in the first 3 stages take an ethnocentric perspective, which evaluates other cultures according to preconceptions that originate in the customs, norms and beliefs of one’s own culture. The final 3 stages represent an ethnorelative perspective, when a person is comfortable with many different norms and customs and is able to adapt their behaviour as a result. situation, diverse perspectives feel uncomfortable. 3. Minimisation of difference – highlights commonalities. In this situation, diverse perspectives feel not heard. 3. Integration of difference – moves in and out of different cultural worldviews, with a strong sense of identity. In this situation, diversity feels involved. This model, although divided into stages, actually represents a continuum or lifelong process. However, through collaborative learning people are able to combine their intercultural abilities – knowledge, skills and attitudes – to participate effectively in dialogue that leads to social change and greater community and global cooperation. See Table 5 for a list of possible challenges experienced as part of intercultural cooperation. The learning process can often be simplified to tracking an individual’s progress; however, in intercultural learning, the collaborative learning of the group is more important for creating concepts for social transformation: where one individual may lack knowledge or skills, another fills the gap and enables effective cooperation. Collaborative learning is a process in which two or more people try to learn something by capitalising on the abilities of one another. Intercultural learning is an example of collaborative learning in which the participants represent different cultural backgrounds. By sharing and comparing knowledge, experience and ideas of participants from different cultural backgrounds, the group is more likely to engage in radical brain-storming and create new concepts which are more than the sum of the ideas of individual members. Other examples of collaborative learning include the study circle in non-formal adult education, communities of practice (see chapter 3 for more details), crowdsourcing to form ideas to start a new project, Ikujiro Nonaka and Hirotaka Takeuchi’s theories on creating new knowledge, and Peter Senge’s vision of a learning organisation in which the employees are continually learning how to learn together. Another model of collaborative learning is the trialogical learning approach which explores how to create collaborative learning opportunities. Kai Hakkarainen, one of the developers of the trialogical learning approach, distinguishes between three different metaphors that describe various learning approaches. (Hakkarainen & Paavola 2009). Monological approach or knowledge acquisition metaphor. In this approach, knowledge is shared one way, from the facilitator to the learner, occurring within the mind of the learner. In intercultural learning, the knowledge acquired can be about the customs, beliefs and norms of different cultures. See figure 4. Dialogical approach or participation metaphor. This approach, knowledge-sharing is a two way process between the facilitator and the learner: both are learning from each other’s knowledge and skills. Building relationships and networks by participating in respectful dialogue within different cultural settings is an example of this approach. See figure 5. 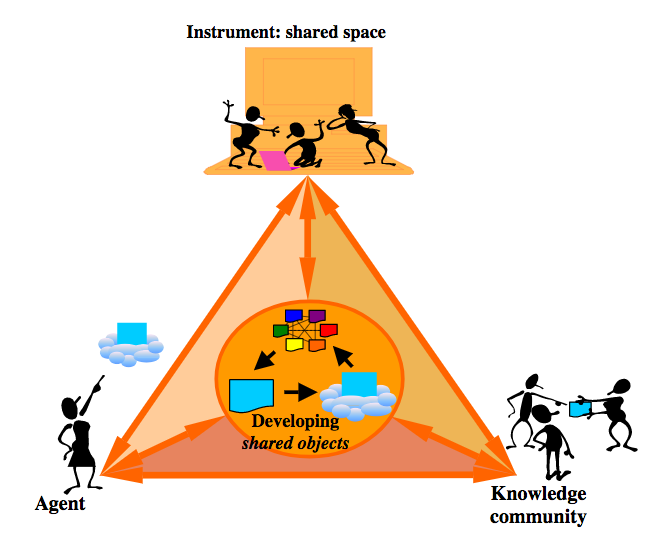 Trialogical approach or knowledge-creation metaphor. This approach is a combination of the above approaches with the addition of a third element. Learning occurs within the minds of the individual participants or agents (monological approach). Learning occurs between the participants as a learning or knowledge community as they share experiences and ideas (dialogical approach) in a safe space. 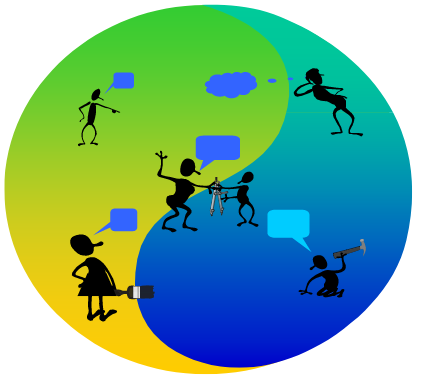 Finally, as a result of the sharing, the participants collaborate together to create new concepts or new knowledge “objects” to tackle social and global challenges (the third element for the trialogical approach). A new theory is an example of a collaborative output or knowledge “object”. See figure 6. “The complex environmental, social and economic issues of the 21st century can no longer be resolved by repairing existing systems. There have been many inadequate responses to climate change, the obesity epidemic, toxic pollutants, shortage of fresh water and urban violence. […] Collaboration alone cannot resolve these complex problems. In resolving society-wide issues, transformational change based on collective action has become not optional but a necessity, not a matter of avoiding but of celebrating change.” (Lambert, 2012. Collective Learning for Transformational Change.